I love altitude. Of course, usually, when I’m talking about altitude, I’m talking about “AGL” (above ground level.) For Memorial Day weekend this year, I managed to spend the entire weekend above 6,000 feet without ever leaving the ground. That’s a pretty good trick, but it’s just everyday life for those on the high plains of Colorado. 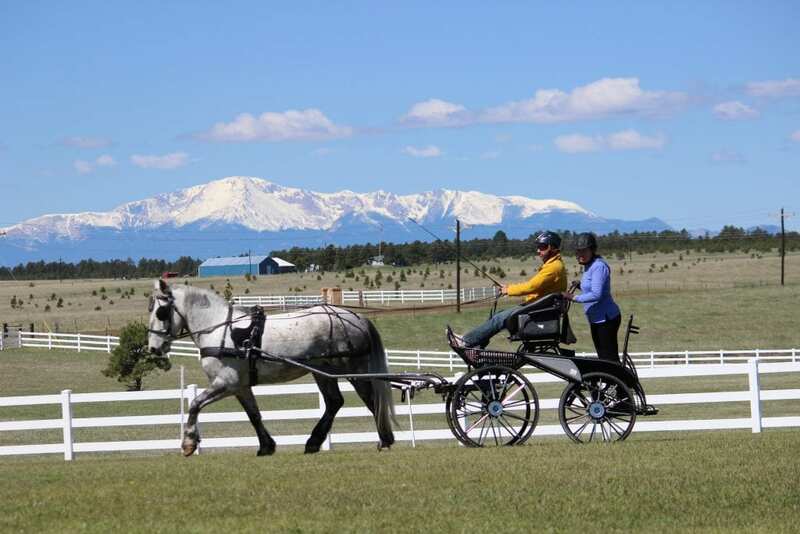 I spent the weekend in Colorado with members of the Colorado Driving Society, and the Rocky Mountain Carriage Club. CODS President Al Senzamici organized and hosted the weekend at his house in Peyton, Colorado. So far this year, this clinic gets the award for “Most Breathtaking Backdrop” with snow-covered Pike’s Peak standing in the background. 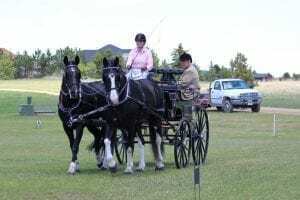 The variety of horses, ponies, and drivers made the clinic lots of fun for me. 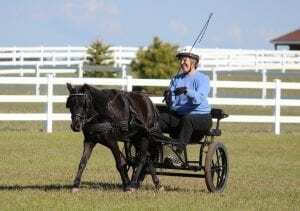 There were all experience levels from the very novice to very experienced both of horses and drivers. We had three people driving pairs, many singles, and even a few long lining lessons. “Understanding Contact” seemed to emerge as the most common thing that I worked on with the drivers there. Years ago, I’d spend all day trying to teach people how to let go of their horse’s faces as they drove. For this clinic, I spent a lot of my time trying to teach people how to pick up enough contact to get the results we were after. This experience isn’t unique these days. We all count our horses among our best friends, so we don’t want to do anything that would be uncomfortable for them. With that in mind, many people are hesitant to “pull too hard” on the reins. While based on the horse’s best interest, that thinking has it’s downfalls. Think of it like this: When we were kids, one of the little games we played was making a “telephone” out of a couple of tin cans and some string or wire. I remember being fairly skeptical that this little experiment would work as we built this little contraption. After all, how would a couple of soup cans and some wire transmit my brother’s voice to me across the house? When we got the cans and the wire all rigged together, my suspicions were confirmed. With the wire between the cans loose on the ground, my brother’s voice barely reached the can I was holding as distance indistinguishable murmur. Then our father instructed us to carry our soup cans to opposite sides of the house, pulling the wire between them taught as we did. To my surprise, I could hear my brother’s voice in my soup can, even as I stood three rooms away down the hall! How does all of this relate to contact with your horse? Well, your reins are the wire between the soup cans. If they are left slack, the communications you put down the reins simply dissipate as they travel down the rein, only reaching your horse’s bit as a distant murmur. When you take the slack out of the rein, movements you make with your hands equate to movements on the bit, which of course equals communication. 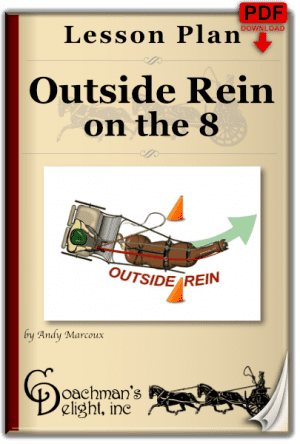 Of course, this leads everyone to ask, “How much weight should I have in the rein?” That’s where things get a little tricky. 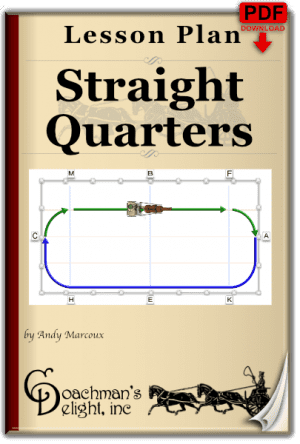 The short answer is, “enough to keep the reins straightened between the harness and your hand, but not so much that you’re pulling on your horse.” That falls far short of a complete answer. The variables that go into finding the right contact are too lengthy to list here. We spent the weekend using various lesson plans and activities to help both horses and drivers finding their “happy place” of contact. Of course, we worked on more things than just establishing the right contact. Al transformed his back yard into a dressage arena that included a couple of trees and some mild pitch at one end. Anyone can work horses in a ring without terrain and obstacles! It takes good driving to get your ponies around a ring like that as if those challenges didn’t exist. We used the ring to work on planning out their figures balancing their horses for turns and transitions. The weather moves quickly on the high planes, so we had to retreat to the indoor ring frequently as the weather moved through the area. In fact, the weather moved so quickly that one lesson in the indoor would be followed by a lesson outside, then we’d get chased back under cover. I think I came home with as many pictures of the weather as I had pictures of ponies! The group of about a dozen drivers wasn’t deterred by the weather. Everyone remained engaged and enthusiastic throughout the clinic. The majority of drivers took several lessons throughout the 4-day clinic. That really gave us lots of opportunities to build one successful lesson upon the other. I think before we even started we were talking about making plans for a follow-up clinic later this year. Now it’s just about finding dates and choosing the location to have the next clinic. I, for one, can’t wait to get back to see all of the drivers and ponies I met there. What a great group to work with! Can you list them somewhere else, Andy, please? I and my horse are both newbies (at the long rein stage only so far) and it is the contact that’s really flummoxing me. I ride with very little rein contact, which both my Morgan mare and I prefer, and it works really well for us. She is extremely responsive to that and to the aids from my body. I’m sensing some resentment on her part when I try and take up more contact in our long lining exercises. I find it really difficult to rely on reins only: the horse seems to be so very, very far away after having horses right beneath me for the past 30 years or so! She is relatively responsive to voice commands and that’s improving. It can be difficult transitioning from riding to driving, especially since driving relies so much more on contact for communication. One thing to check on in your long lining is that you are using light weight long lines. If the lines are heavy, they will significantly increase the amount of contact your horse feels. I use Perri’s long lines for all of my long lining. They are just the right combo of length and weight for long lining. I’ve posted an article “Connecting With Contact” that discusses contact more completely. Hopefully, that will help you improve your understanding of contact. After that, it’s really just practice, practice, practice. Keep at it, and it will come to you and your horse. We enjoyed the clinic so much and we are looking to have Andy return as soon as possible to keep the momentum of our learning going. I have had so many of our clinic participants comment on how great it was and how much it tied all of the webinars with the lesson plans Andy provides together. The hands on and in person training just gave everyone that little “boost” beyond the webinars and lesson plans. You received immediate feedback and corrections when following the plans. It also showed that no matter what level you are currently at sometimes you need to step back to improve on one of your basic skills. Looking forward to watching my next webinar tomorrow night and getting Andy back out here to Colorado (during better weather conditions) so he can more fully enjoy the beauty of the state.